If you choose to correspond with us through email, we may retain the content of your email messages and/ or through our Help Desk in the client area together with your email address and our responses. We provide the same protections for these electronic communications that we employ in the maintenance of information received by mail and telephone. Similar to other commercial Web sites, our Web site utilises a standard technology called "cookies" (see explanation below, "What Are Cookies?") and Web server logs to collect information about how our Web site is used. Information gathered through cookies and Web server logs may include the date and time of visits, the pages viewed, time spent at our Web site, and the Web sites visited just before and just after our Web site. This information is collected on an aggregate basis. None of this information is associated with you as an individual. Cookies are a feature of Web browser software that allows Web servers to recognize the computer used to access a Web site. Cookies are small pieces of data that are stored by a user's Web browser on the user's hard drive. Cookies can remember what information a user accesses on one Web page to simplify subsequent interactions with that Web site by the same user or to use the information to streamline the user's transactions on related Web pages. This makes it easier for a user to move from Web page to Web page and to complete commercial transactions over the Internet. We use Web site browser software tools such as cookies and Web server logs to gather information about our Web site users' browsing activities, in order to constantly improve our Web site and better serve our customers. This information assists us to design and arrange our Web pages in the most user-friendly manner and to continually improve our Web site to better meet the needs of our customers nd prospective customers. Email that you may send to us may not be secure unless we advise you that security measures will be in place prior to your transmitting the information. For that reason, we ask that you do not send confidential information such as account log ins to us through an unsecured email. Registration Data is the property of Web Hosts Australia. Web Hosts Australia will not sell, rent, swap, or otherwise disclose your Registration Data to any third party. Web Hosts Australia maintains a secured area on the Site for transmission of Registration Data. Unless you select not to through a ticket in the Help Desk, Web Hosts Australia reserves the right to use your Registration Data to send you information about Web Hosts Australia, the Site, Web Hosts Australia products and services, and other topics in which you have indicated an interest. You may access your Registration Data at any time through the Client Info section of the support site. This area is password-restricted for your protection. You may cancel your account at any time by submitting a ticket at any time through the Help Desk. 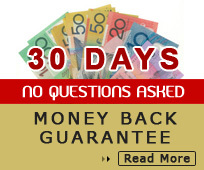 Except in the case of being eligible for the 30 days money back guarantee 30 days notice prior to the next anniversary billing date is required. Although Web Hosts Australia will use all reasonable efforts to safeguard the confidentiality of the Registration Data, transmissions made by means of the Internet cannot be made absolutely secure. Web Hosts Australia will have no liability for disclosure of Registration Data due to errors in transmission or unauthorized acts of third parties. Web Hosts Australia reserves the right to disclose to third parties information about Subscriber usage of the Web Hosts Australia Web site and any related services, including information gathered during your use of the Site. Any information disclosed will be in the form of aggregate data (such as overall patterns or demographic reports) that does not describe or identify any individual user.